Preface. List of contributors. Chapter 1. Physical properties and functional roles of lipids in membranes (P.R. Cullis, D.B. Fenske, M.J. Hope). 2. Lipid metabolism in prokaryotes (C.O. Rock, S. Jackowski, J.E. Cronan, Jr.). 3. Oxidation of fatty acids (H. Schulz). 4. Fatty acid synthesis in eukaryotes (L.M. Salati, A.G. Goodridge). 5. Fatty acid desaturation and chain elongation in eukaryotes (H.W. Cook). 6. Glycerolipid biosynthesis in eukaryotes (D.E. Vance). 7. Ether-linked lipids and their bioactive species: occurrence, chemistry, metabolism, regulation, and function (F. Snyder). 8. Phospholipases (M. Waite). 9. Glycerolipids in signal transduction (J.D. Lambeth, S.H. Ryu). 10. Adipose tissue and lipid metabolism (D.A. Bernlohr, M.A. Simpson). 11. The eicosanoids: cyclooxygenase, lipoxygenase, and epoxygenase pathways (W.L. Smith, F.A. Fitzpatrick). 12. Sphingolipid: metabolism and cell signalling (A.H. Merrill, Jr, C.C. Sweeley). 13. Isoprenoids, sterols and bile acids (P.A. Edwards, R. Davis). 14. Lipid metabolism in plants (K.M. Schmid, J.B. Ohrlogge). 15. Lipid assembley into cell membranes (D.R. Voelker). 16. Assembley of proteins into membranes (R.A.F. Reithmeir). 17. Structure, assembley and secretion of lipoproteins (R.A. Davis, J.E. Vance). 18. Dynamics of lipoprotein transport in the human circulatory system (P.E. Fielding, C.J. Fielding). 19. Removal of lipoproteins from plasma (W.J. Schneider). This is the third edition of this advanced textbook, written with two major objectives in mind. One is to provide an advanced textbook covering the major areas in the fields of lipid, lipoprotein, and membrane biochemistry, and molecular biology. The second objective is to provide a clear summary of these research areas for scientists presently working in these fields. 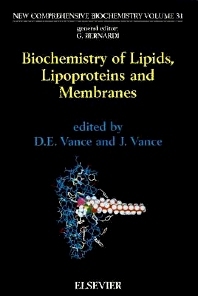 The volume provides the basis for an advanced course for students in the biochemistry of lipids, lipoproteins and membranes. The book will satisfy the need for a general reference and review book for scientists studying lipids, proteins and membranes. Excellent up-to-date reviews are available on the various topics covered. A current, readable, and critical summary of these areas of research, it will allow scientists to become familiar with recent developments related to their own research interests, and will help clinical researchers and medical students keep abreast of developments in basic science that are important for subsequent clinical advances.